Transform your iPad into an on-the-go multi-track recording studio. More than just a mixer, the Alesis iO MIX is a four-channel audio interface that delivers safe and secure iPad integration. Together, your iPad and iO MIX serve up a totally integrated recording studio that can accompany you down the street—or around the world. Simply slide in your iPad, attach the 30-pin or Lightning dock connector, and lift the hinged door into position. Your iPad is now safe and secure in a road-ready package that offers unlimited access to the multi-touch screen. Load up your iPad with any compatible Core Audio app—including GarageBand—and your studio is open for business. Arapolarmic is an innovative tool for the professional audio industry for monitoring the directivity of microphones and have a database with its technical characteristics (miclibrary) always with you. 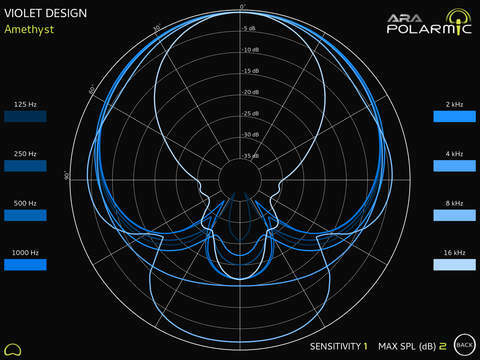 Arapolarmic makes possible for the first time the visualization of the microphone and its polar pattern, integrated within its audio environment (microphone set and sound sources) using Augmented Reality technology, providing visual reinforcement in making decisions for positioning of microphones on any set. Arapolarmic shows the polar pattern of the microphone models that are included in the miclibrary of your device in real time. The position and orientation of the microphone is captured through the camera of your iPad, which is then overlapped over its polar pattern, allowing the user to view through the screen its orientation and position. This feature permits the user to see immediately the polar pattern of the microphone relative to the sound sources. The system integrates a database with a library of microphones. The data sheet of each microphone’s model is quickly available without an internet connection. 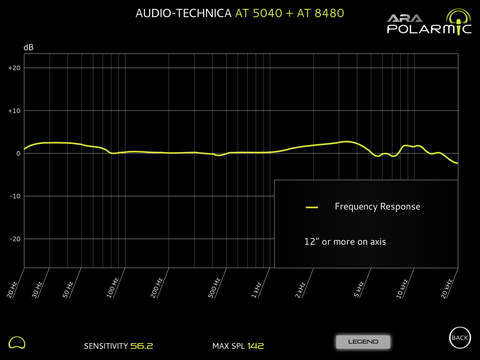 The fast access to the data makes Arapolarmic a reference tool for querying the technical specifications of professional microphones. The new versions, also improve recognition system computer vision system, will include new features and new microphone models, also the most requested by users Arapolarmic, expanding the library of microphones and, therefore, the tool. – It is recommended to work with indirect or diffused light. – The system operates under variable lighting conditions (cold, warm, strong, faint…) but a certain amount of light is necessary for the camera to detect the microphone. – Avoid working under backlight conditions. – Direct light to some microphone’s body models might cause reflections that could confuse the computer vision system (CVS). – Conditions of fluorescent flashing light might cause less reliable tracking process (CVS). In this case, enhancing of the lighting conditions might improve the process. – Arapolarmic requires some user interaction in the matching process. The proper matching of the virtual and real microphones before initializing the process of automatic matching is determinant in keeping the polar pattern aligned and on the right position. This process requires certain level of practice from the user. The first Arapolarmic version requires working with soft movements while slowly moving away. To best use the tool to see all 6 advised Arapolarmic tutorials available on our YouTube channel. newest microphone, the NT-USB — a studio-grade microphone with the convenience of a digital USB interface. The NT-USB is fully compatible with MacOS, Windows and iPad. between the computer/iPad audio and the microphone input. register their microphone on www.rodemic.com. For more information please visit www.rodemic.com/nt-usb. VocaLive provides singers and vocalists with a suite of 12 real-time professional vocal effects along with a capable recorder for studio-quality sound in a portable package. The effects can be combined into a chain of 3 processors and saved as presets. A collection of up to 50 presets is included to get you up and running immediately. VocaLive for iPhone includes 5 Vocal Effects – Pitch Fix (for tuning correction or stylized quantization FX), Choir (a 3-part harmonizer), Morph (a formant shifter to change the tonal quality of the voice from subtle deepening to radical gender bending), De-Esser (to remove sibilance from the voice), and Double (by registering) – along with 7 Studio Effects – Reverb, Delay, Parametric EQ, Compressor, Chorus, Phazer and Envelope Filter – that together provide unparalleled creative processing power. With VocaLive you can record vocals and instruments, process your recordings with effects, sing along to any song in your iTunes Music library — its Voice Cancel feature lets you practice over the existing vocals — and warm up your voice with its helpful included vocal warm-up tools. VocaLive is an incredible professional vocal effects workstation that you can take with you anywhere. And now you can also take advantage of VocaLive 2.0’s new studio section, which lets you record and edit audio like in a computer DAW. It has an intuitive interface that gives you a detailed waveform visualization (with a time grid and quick undo/redo), touch-and-drag looping, easy punch-in and punch-out recording, a quick per-channel FX enable/disable button and streamlined access to all recording and mixing controls. For the best quality, use VocaLive on stage with iRig Mic HD, IK’s new high-quality handheld digital microphone. But you can also have fun with it and record quick ideas using the built-in microphone on your iPhone or earbuds. PreSonus® Capture™ for iPad® is a powerful 32-track audio recording application with up to 24-bit, 96 kHz fidelity and a lean and easy-to-use design. With level and pan control for balancing your tracks and essential editing features using intuitive finger gestures, Capture for iPad is the perfect mobile recording solution. Compatibility with PreSonus AudioBox iOne and iTwo USB/iPad interfaces (or any other MFi iPad interface) enables you to record high-quality audio anywhere inspiration strikes. With Capture for iPad, you can record and save multiple songs on an iPad, and Capture is the only app that provides direct wireless transfer of your recordings to PreSonus Studio One® for Mac® or Windows® (version 2.6.3 or later), where you can edit and mix. A link to a free version of PreSonus Studio One is available in the app. Songs and individual tracks can also be copied using iTunes if the iPad is connected to the computer with a USB cable. Compatible with iPad only. Requires second-generation iPad or newer, iPad Air, or iPad Mini and iOS 7 or later. Works with iPad-compatible (MFi) audio interface (including PreSonus AudioBox iOne and iTwo) or the internal iPad microphone. The realistic sound of famous reverb equipment for your iPad and iPhone! Includes a large built-in library of the highest quality reverb impulses taken from actual devices and the possibility to upload your own reverb space impulses. Intuitive and compact user interface for maximum ease and efficiency. Briefly, convolution reverb is based on a process that digitally ‘captures’ the reverb characteristics of another reverb effects unit or the reverb response of a real acoustic space. It is based on the mathematical convolution operation, and uses a pre-recorded audio sample of the impulse response of the device or space being modeled. The process of convolution multiplies each sample of the audio to be processed (reverberated) with the samples in the impulse response file. ● More than 200 samples of factory presets from different devices. ● Convenient choice sample by device name, by reverb type or in complete list. ● Pre/post parametric equalizer with cut-off filters. ● Additional mode ‘reverb only output’ for use with mixing consoles. ● Uploading samples through Web access, audio clipboard, from another app and iTunes. Pocket Studio: Produce an album or 2, or 3 on your iOS devices! – Import multitrack audio stored in a zip. (Use Dropbox or some online drive app to open zip in Pocket Studio. Don’t pay for studio time, Buy the Studio! – Recording Input: Tap “input” on any track to set the audio source, tap the top record enable button on the track, tap the lower right record button on the menu bar/transport then tap play to begin recording. – Beauty, Functionality and Quality all in 1 app. 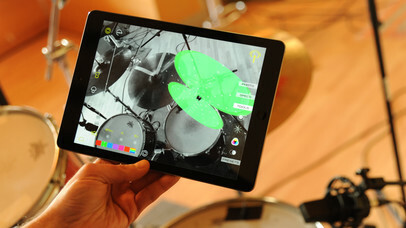 – Import iPod Music + your BeatPad beats & Record 90+ tracks of HD music and vocals in Pocket Studio! Pocket Studio is light-years ahead of the competition and quite frankly, costs a fraction. audio quality as well as providing multi-channel and LAN support. And with onboard cue mix capability for talkback and monitoring, it’s just like in a typical recording studio environment, but that’s probably as representative as it’ll get: you could be anywhere besides the studio! • Sing, hum, rap, strum. Take captures your musical ideas—anytime, anywhere. With a single tap you’ll be recording, beatboxing, overdubbing, riffing, writing, trying out song ideas that you’ll want to share with the world. Inspiring built-in clicks, loops and beats to kick start your creativity. Three tracks to build on your tune and flesh out your ideas. • Surprise yourself with how good you sound. • Share on Facebook, Twitter, email. Australian pro-audio manufacturer RØDE Microphones has today announced the iXY with Lightning connector for iPhone 5, 5s and 5c — the highly-anticipated update to RØDE’s stereo microphone for Apple iPhone devices, that allows high-quality recording at sample rates up to 24-bit/96kHz. “The original iXY was an industry leader in both design and function, so we’re thrilled to continue this success with the updated version for iPhone 5.”commented Damien Wilson, RØDE’s Global Sales and Marketing Director. “Being able to record at this quality with a device that sits in your pocket has been a game changer not only for audio professionals, but for enthusiasts alike. We saw this first-hand with so numerous entrants to our My RØDE Reel short film competition choosing to use the iXY for their amazing short films”. The RØDE iXY is shipping now. Visit www.ixymic.com for more information.